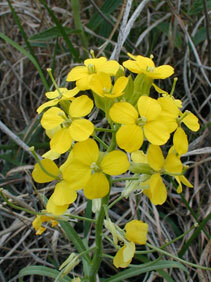 Erysimum asperum (Nutt. ) DC. Stems: Erect, solitary, simple or branched above, ridged, covered with appressed, branched hairs. Leaves: Alternate, simple, sessile, numerous, linear or lanceolate, 1/2 to 4 inches long, less than 1/2 inch wide; margins toothed to entire; tips somewhat pointed; upper leaves reduced. Inflorescences: Racemes, terminal, elongating at maturity. Flowers: Showy, 4-parted; sepals erect, about 2/5 inch long; petals 1/2 to 1 inch long, nearly as broad, on stout stalks, yellow to yellowish orange; stamens 6, 2 short, 4 long. Fruits: Pods, linear, 3 to 5 inches long, less than 1/10 inch wide, 4-angled, widely spreading, densely pubescent; seeds numerous, small, oblong, brown. Habitat: Dry open prairies, pastures, and sand hills.